Happened to be in Tanjong Pagar area over the weekend when we were hungry. As most places are only opened on weekdays and it was still early for dinner, our choices were limited. 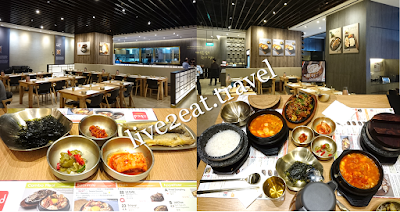 Found sbcd tucked away in a corner at B1 of Tanjong Pagar Centre, and decided on the Korean Tofu House. Other than tofu stews that contain pork (except for the vegetarian option) and vegetables, it also offers mains such as bibimbap, bulgolgi and teriyaki chicken. Appetisers include mandu or fried dumpling, japchae and jeon – prawn tofu or seafood pancake. Sundubu, or soontofu as it is spelt here, means soft tofu in Korean and is handmade daily for adding into the stew served with an egg. Chose pork over beef for my original soontofu at mild (medium is the standard) spiciness while my dining companion ordered a spicy bbq pork combo meal and chose spicy level for the original soontofu with pork. Both were served with hot stone rice and complimentary banchan – fried fish and refillable kimchi, seaweed, squid, pickled green chilli. The mild level was shiok without numbing the senses so I could taste the soybean in the silky-smooth and wobbly-soft beancurd, and savour the sweetness of the tender meat. No complaints about the comfort food in a spacious setting. Grab a free prebiotic drink on your way out, to aid digestion and douse any fire in your stomach.